Cisco shares fell by over 4% in trading afterhours on Wednesday after reporting better than had been expected earnings for the fiscal third quarter that ended April 28. Cisco earnings reached 66 cents a share excluding special items compared to analyst expectations that averaged 65 cents a share. Revenue for the company reached $12.46 billion, while analysts were expecting $12.43 billion. Cisco in a prepared statement said that it was expecting between 68 cents and 70 cents per share earnings for its fiscal fourth quarter, excluding special items with revenue growth of between 4% and 6%, which equals between $12.61 billion and $12.85 billion. Analysts were expecting 69 cents in per share earnings excluding special items and revenue of $12.73 billion. The services business for the company produced revenue of $31.6 billion, which came in below the $3.23 billion estimated by Wall Street. Three of the four product categories for Cisco beat estimates. Its most important, Infrastructure Platforms, which includes networking switches for data centers ended with revenue of $7.16 billion compared to expectations by analysts of $7.14 billion. Cisco will be introducing additional software services, including those associated with its routing products, said CEO Chuck Robbins during the earnings call for the company with analysts. The introduction, Robbins said, would create headwinds for the short-term, but over the long-term it is the right thing for the company to do. In its Other Products division, Cisco missed on expectations, with revenue of $249 million compared to the estimate of $253 million. Revenue for that segment was off by more than 6%. During its fiscal third quarter the company announced a screen sharing TV dongle and said that it is planning to work on developing networks of 5G mobile with the Saudi Telecom Company. Cisco announced recently it sold its Service Provider Video Software Solutions company to Permira. The terms of that were not released, although a report said that Permira coughed up $1 billion to buy it. 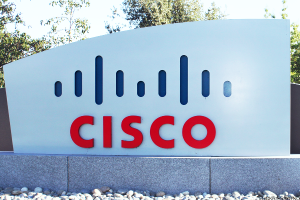 Cisco is not seeing an improvement to the data center routing business or the service provider video business, and guidance for the fourth quarter reflected that, said CFO Kelly Kramer during the analyst call for earnings. During the quarter, over $67 billion was repatriated by Cisco and it earned over $1.3 billion in a one-time tax payment for foreign income tied to the recent U.S. tax reform laws. Since the start of 2018, Cisco has seen its stock increase 17%.